Advisor Vijay Kumar honouring J&K Forest team players and officials in Jammu. JAMMU, Jan 17: Advisor to Governor, K Vijay Kumar today felicitated the sportspersons of the State Forest department here who have won 5 medals in recently concluded 24th All India Forests Sports Meet-2019 held at Raipur, Chhattisgarh. 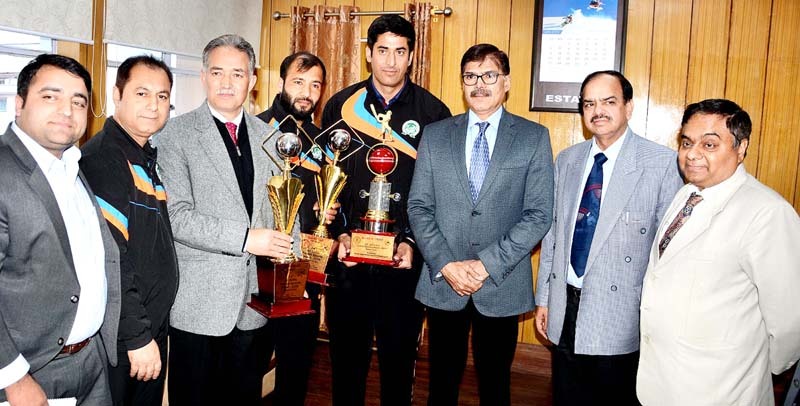 Commissioner Secretary Forests Manoj Kumar Dwivedi, PCCF J&K Suresh Chugh, CCF Faroq Ahmad Gilani and other senior officers of the department were present on the occasion. While interacting with the Captains of the winning teams, it was informed that Billiards and Snooker teams have won gold medal while as Golf, Cricket and Football teams won silver medals bagging the Runners-Up positions. Advisor Kumar congratulated the players for their impressive performance at the national level games and bringing laurels to the department by winning 5 medals in the team events. He also lauded the role of the department in providing every kind of support to the players and making them able to perform at their best in the games.